Check after the jump for the full article, and let us know what you think in the comments below! Where would you start if you were constructing the Skywalker family tree? Let’s start with Anakin. If you ask me, Anakin is a level 50 Sith Warrior anchoring the top of the family tree. He’s married to Padme Amidala and they have two kids, Luke and Leia. Luke and Leia were both strong in the Force, like their father before them. Leia ends up marrying Han Solo, undoubtedly a level 50 Smuggler, and they have three children who all turn out to be Jedi. Luke marries Mara Jade, and they in turn have Ben, who is also a powerful Jedi Knight. Looking at their family tree, it’s clear that the Skywalker legacy produces powerful Force users and great heroes. 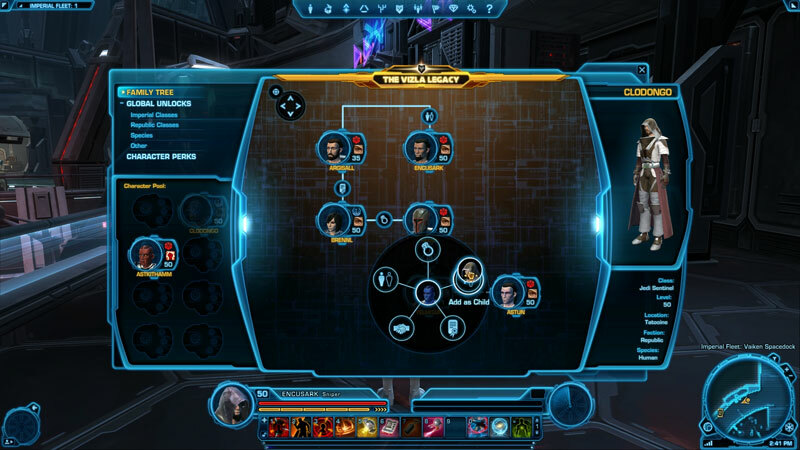 From the very beginning of development on Star Wars™: The Old Republic™, we felt that the idea of familial bonds was a cornerstone of the Star Wars™ experience. 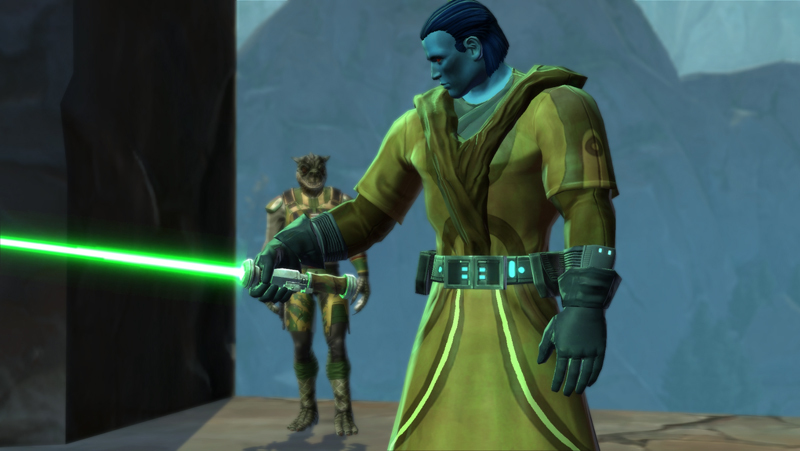 In this blog, I’m going to explore what that means and what rewards are waiting for the characters in your Legacy, as well as exploring the design philosophy behind the changes we made. You may have already started your Legacy by picking a Legacy Name. This happens when you finish Chapter 1 with your first character. From this point, all of your characters on that server are now considered part of your Legacy, regardless of faction. This means that any existing characters which have not been played past Chapter 1 will gain a Legacy Name, and any newly created characters will also have their Legacy Name available from character creation. From Game Update 1.2: Legacy, unlocking your Legacy grants you access to a newly expanded Legacy Panel (accessed, by default, by pressing the ‘Y’ key) where you can modify your family tree, and see what Legacy Rewards you have unlocked. Your Legacy’s bloodlines are constructed on the family tree page, where you can see all of the characters that are part of your Legacy, and drag them into place according to their relationship to each other. Want your Smuggler’s father to be your Sith Warrior? Maybe your Agent is a noted rival of your Trooper? Your Consular’s brother is an Inquisitor? It’s all possible, as your characters can be linked together in any combination as siblings, spouses, adopted children, children, rivals and allies. We hope that players use the family tree as a way to better roleplay their characters, visualize their relationships, and craft stories about their lineage. But what do your characters learn from each other? Fathers pass family knowledge down to their sons. Allies share information with each other. Even rivals must learn everything about their foes in order to know their enemies. Likewise, the characters in your Legacy will be able to earn global unlocks, which are abilities, emotes, and other rewards shared across all characters in your Legacy. If one character unlocks something, all characters, regardless of familial relationship, earn the same unlock. Let’s look at different categories of unlocks. When characters in your Legacy reach important story milestones, they can pass down special emotes and abilities to other characters in your Legacy. On completing Chapter 2 with a character, your characters gain the use of an emote unique to that class. For example, if you finish Chapter 2 with your Inquisitor, you unlock an emote which causes your character to throw lightning between his hands. Again, all characters in your Legacy can use this emote. Likewise, at completion of Chapter 2, your characters unlock the ability to apply that class’ unique buff along with their own. For example, if you complete Chapter 2 with an Agent, and then create a Bounty Hunter, when you use the ability Hunter’s Boon it also applies the effects of the Agent’s Coordination buff. After one of your characters completes Chapter 3, that character gets to pass on a special ‘Heroic Ability’ to all the characters in his Legacy. Powerful Sith Warrior in your Legacy? His Jedi children can “Force Choke” enemies. Father was a high ranking Imperial Agent? 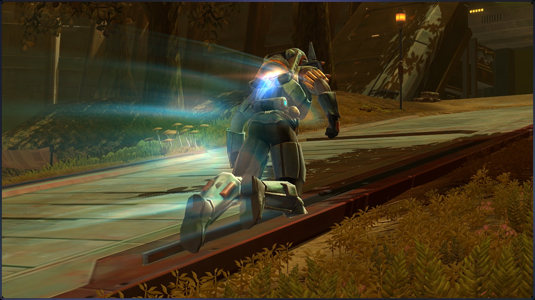 Call in some old favors and request “Orbital Strikes” from Imperial warships. Your sister is a notorious Smuggler? She taught you that… special… kick that only Smugglers know. Some of you may be concerned about Heroic Abilities making the game unbalanced or just looking wrong if used frequently. We had this in mind during development, so as a result Heroic Abilities can only be used while you are using your class’ Heroic Moment ability. These are abilities you already have that require an active companion to use and that currently boost your regeneration while active, allowing you to take on tougher opponents. By requiring you to use these abilities with a companion present, we ensure that people who play multiple characters do not gain an advantage during the end game or in Warzones. By also only allowing Heroic Abilities during the brief window of time that a Heroic Moment ability is active, they remain a relatively rare occurrence. You won’t see Jedi running around spamming Force Choke all the time. Heroic Abilities are very useful for leveling up new characters, for taking on tough bosses and PvE content as well as being handy roleplaying additions. Our intention is not to upset end game balance with them, and hopefully you will agree. When you complete all possible conversations and quests with a companion, you receive a companion unlock that is granted to all characters in your Legacy. The first companion you unlock of each companion combat archetype (ranged tank, ranged DPS, melee tank, melee DPS, and healer) gives you a unique unlock for that companion type that grants a passive stat bonus. These first-time archetype unlocks also modify the duration and cooldown times for your Heroic Moment ability. This ensures that a single character can potentially attain the full range of companion stat boosts and Heroic Moment modifiers, while also ensuring that a player who has severely mistreated one companion can get that unlock by playing an alternate character. 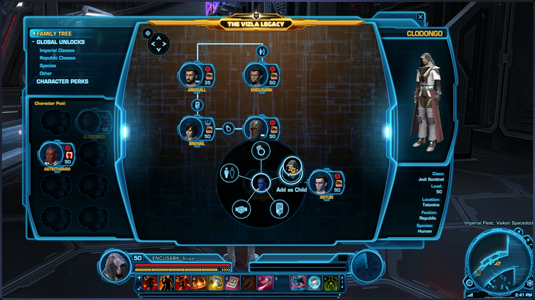 For example, a Sith Warrior who has mistreated Vette may find it extremely hard to get her unlock, but unlocking any other ranged DPS companion on any other character will grant the same archetype unlock. Additional companions unlocked beyond the five combat archetypes grant a passive bonus to your Presence stat, increasing the power of your companion characters. Can Sith Purebloods ever find a path to the light side? Is a Miralukan’s Force sight good enough to fire a sniper rifle with any accuracy? 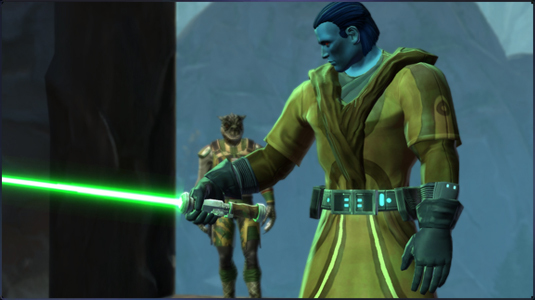 Do Mirialans make for good Sith Inquisitors as well as Jedi Consulars? 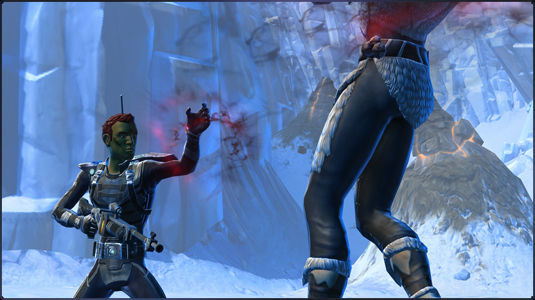 With Legacy species unlocks, you can tell those stories with your own characters. Playing a character of any species to level 50 unlocks that character’s species as an option at character creation for all classes. All combinations of class and species are now possible given the right unlocks. Opening these new combinations gives much more freedom at character creation. By having to earn these unlocks, instead of just allowing all combinations by default, we ensure that combinations like Jedi Pureblood are still uncommon, and require someone to have invested time in a Sith Pureblood Legacy to attain them. Additionally, if you unlock a species like Cyborg that has unique customization options per class, you open up all possible customization options for every class. Your new Cyborg Smuggler can have the Agent’s cybernetic eyepieces, or the sinister looking facial cybernetics of the Sith Warrior. If you have enough credits and a high enough Legacy Level, you may also unlock additional species combos by purchasing them for a large number of credits. The cost for bypassing the unlock requirements is high, but it allows players who may have played a human to 50 and beyond a chance to start their next character as the species and class of their choice if they have the credits to spare. By attaining high enough Legacy Levels and spending credits, players will be able to purchase unlockable items for their ship. Wish you could pick up your mail on your ship? There’s a mailbox you can purchase if you are the right Legacy Level and spend a few credits. Neutral Galactic Trade Network Terminal? Better be ready to shell out some credits for that one! 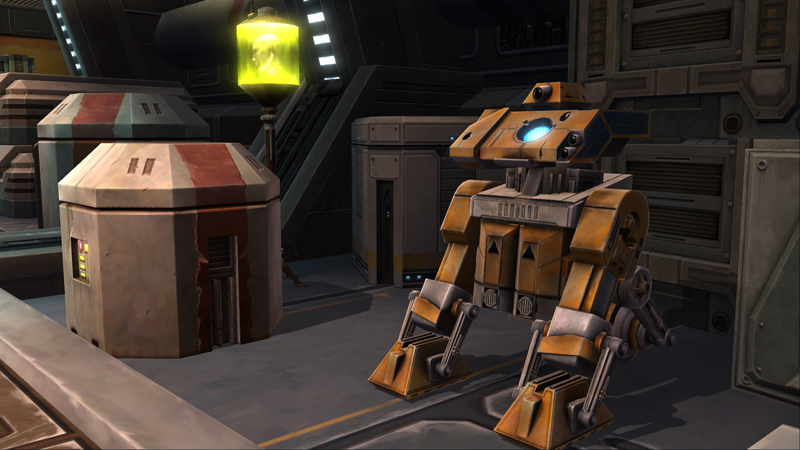 Wish that you could love your ship’s protocol droid even more than you already do? 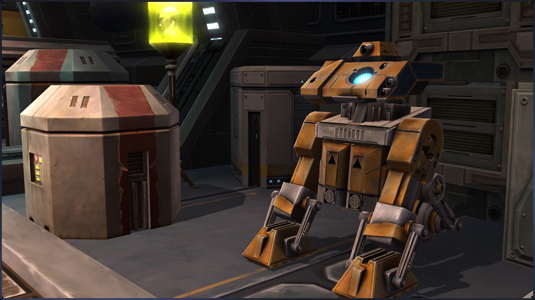 A new astromech you can acquire for your ship sells unique sensor modules for your beloved C2-N2 or 2V-R8 that give him crafting specializations, just the same as your other companions. 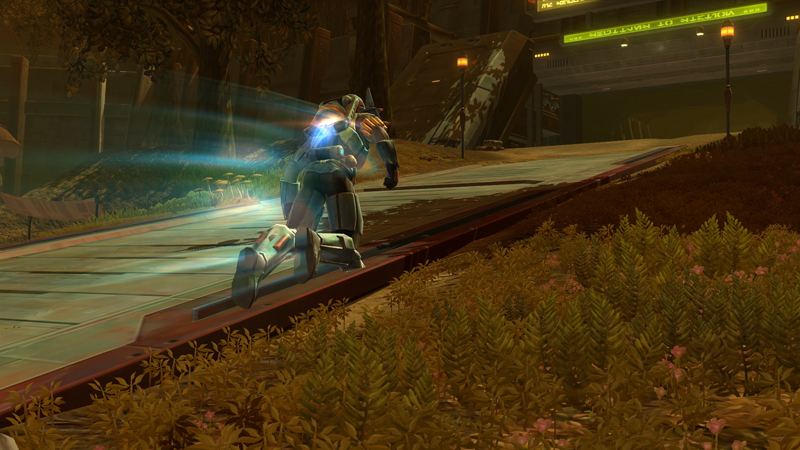 In case that’s not enough, the astromech also repairs items and buys your junk! As with all unlocks attained through the Legacy System, when you acquire something on one character, you acquire it for all your characters. That means what a new character in your Legacy gets their ship, they will climb on board for the first time to find all of your purchases already in place and waiting. The Legacy System does not end with Game Update 1.2; we’re already designing new Legacy additions for future updates. The first of these will arrive in Game Update 1.3, when we will be introducing an extension of the system that adds per-character perks that are not shared globally amongst your Legacy. These new perks will allow players to customize the way their characters progress, as well as new rewards, conveniences, and all kinds of other fun surprises. We won’t stop there, either. The Legacy Team is already looking to future Game Updates. We will continue to expand and build upon the Legacy System for years to come, just as you continue to expand your family tree and build upon your own Star Wars legacy. We look forward to hearing your feedback on Game Update 1.2 and hopefully we’ll see many of you on the Public Test Server.